Is there a polls module? !Hubzilla Support Forum Does Hubzilla have polls? Is there an addon to install it? in /admin/features open the "editor" featuer. in there you can enable the "voting tool," which gives you an additional button in the editor's toolbar. clicking on that you get a simple voting tool with the post: agree, disagree, abstain options and a count of how many of which have been clicked. 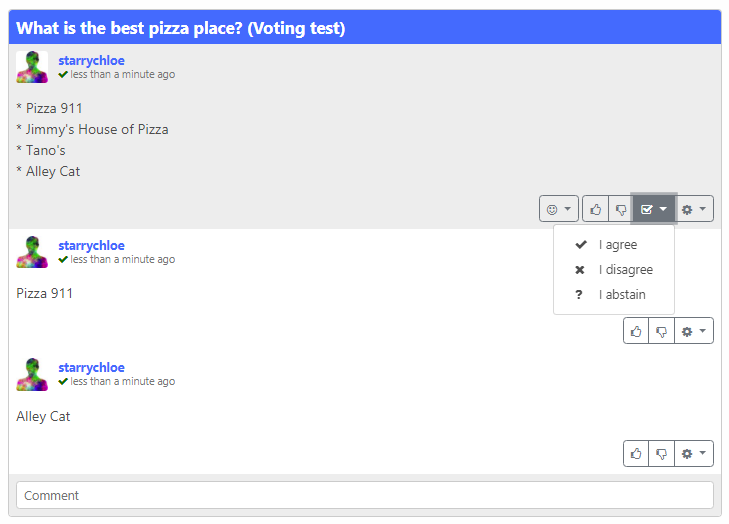 Hubzilla currently has 'consensus tools' which allows you to pose questions for voting on (with results displayed). A database table exists which supports the entire range of polls available across the federated web. There are (iirc) five different poll formats and they are all (of course) completely incompatible. Every protocol will need to translate this data to the format applicable to that network. I think it will require one additional database change because ActivityPub and Zot6 identifiers MUST be uris and Diaspora identifiers must NOT be uris. I'm kind of busy on more important things at the moment and you're the first person to ask in a couple of years, so it seems to lack urgency. Volunteers are welcome to help out. Hmm, not exactly what I was thinking of. I was thinking more along the lines of Facebook polls. so the existing voting tool works, but only between hubzilla contacts? i've seen a few posts with votes attached, but never checked if or how those were working across the fediverse. I was thinking more along the lines of Facebook polls. i don't have a FB account anymore and don't remember what polls look there, how they work. what's the difference? i guess you can define your own options? i can't imagine that such polls could federate across different networks. that would require that all of them implement them in a compatible way, which i don't think could happen any time soon. a special type of post for that purpose might be possible, like articles or wikis, which don't leave the hub but can be seen and voted on by those who have access, no matter what network they come from. this wouldn't be trivial and take some time & effort from somebody who really wants it. I've spent a great deal of time figuring out how to do it in a compatible way. I assure you it can be done (unlike many other federation activities). If somebody wants to work on it, I'd be glad to explain how. In a nutshell, Diaspora associates a guid with each answer. OStatus numbers questions sequentially, so you're always choosing 1, 2, 3, etc... ActivityPub is a bit of a mess because the ID is the "answer text". There's no way to translate it. Hubzilla currently just has a question and you can choose one of three responses. Of these, the Diaspora approach is the most sensible, and the Hubzilla method is going to be rewritten for more flexibility. So we just store a sequence number for each answer and OStatus is taken care of. We're already storing the text so ActivityPub is taken care of. At this point we just need a URI for Zot6 in addition to Diaspora's GUID and then we can translate them to any other representation. We can provide an emulator to automatically add the three standard Hubzilla responses and then those will be backward compatible. i understand the idea, but i'd have to practically live in the nuts and bolts of the whole thing for weeks to even have a little hope to get anywhere. i find wikis, webpages, and articles much more interesting. those don't federate anyway and i don't even think they should. if others see them on my hub i have complete control over what they look like and how they work. that wouldn't be the case if they were sent across the fediverse. if i ever felt the need for a poll, i'd rather do it in that context, i.e., have it sitting on my hub.